Did you know: ice fortresses tend to be in cold places? It took me a while to convince Courtney to draw Skärva with tummy rumblings, but once she did she loved it. Further proof that I keep this comic running. This comic is so full of surprises. Anyway, you better get used to Sling-Skärva here. Derk may be able to invoke the cartoon powers of getting covered in bomb-soot and then being totally ok by the next comic, but bones don’t heal that quickly in Idenau. Also, in response to Victor, I would just like to explain that I just never got the whole “tummy rumbling = your whole stomach convulsing as if you had swallowed several live snakes” that happens in cartoons, but whatever, HE LOOKS SO CUTE in the first panel. Skarva, you’re the one complaining about being hungry. You get picnic supplies. Beggars can’t be choosers. Except he doesn’t even get picnic supplies! The demons at the Temple of Terror are probably eating those lovingly-prepared sandwiches right now. I think there were a couple whole watermelons, too (did you see the size of those packs?!). You’re right, not once in any of the past 10 or so comics did I suspect that Skarva was such a heavy eater… Oh well, let’s just chalk this up as a charity for those up and coming demons. Well, I mean, he IS part shark. =P And Derk is a big guy. 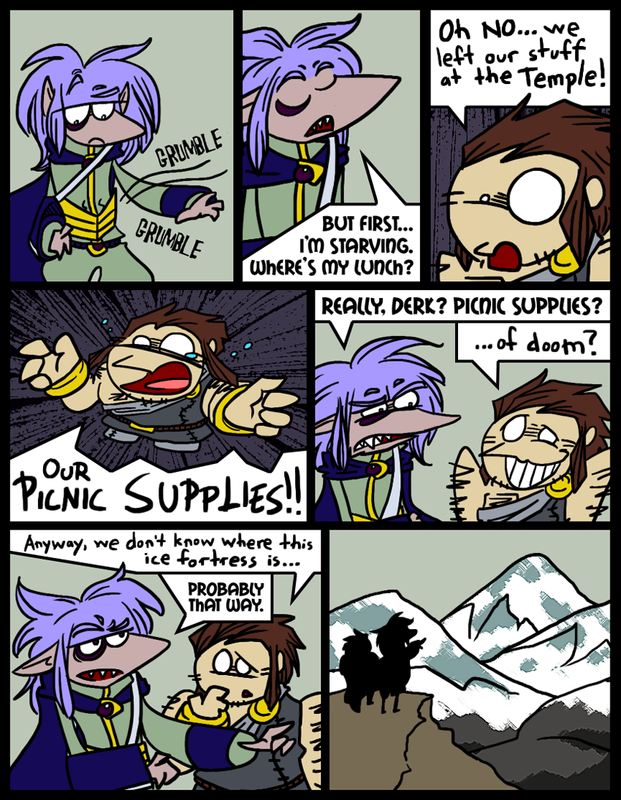 They totally could have gotten through a picnic of epic proportions – but those demons deserve a feast after all the crap they have to put up with in that place. Pffhahaha! Punching Derk’s rock-hard skull would probably lead to Skärva’s other arm being broken, and things would just get ridiculous. Pretty soon Derk is going to be toting him around in a full-body cast. so he should fear the derk?